Can I upload a list of codes for Gift Up! to issue from? Absolutely. 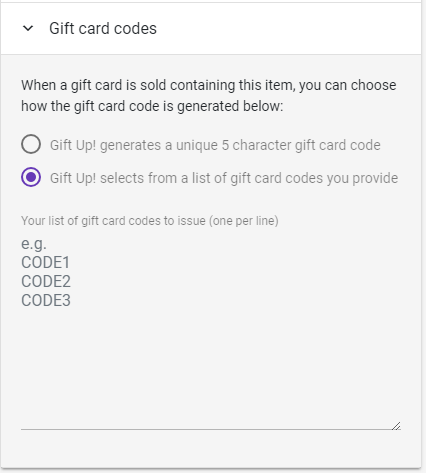 Whenever you sell a gift card for a particular item, you get to choose from 2 options when it comes to what code gets put on the gift card. You can upload the list of codes by editing into the item and uploading the codes there. This is great if you have either printed lots of gift cards or have an external system that can generate codes that behave like gift cards (like an e-commerce cart we don't yet support, or a point of sale terminal). What about custom value gift cards? We recommend not turning on the ability for your customers to buy custom value gift cards for the simple reason that those gift cards cannot have codes allocated against them in advance (we generate a code whenever a custom value gift card is sold, thus is will not work automatically in your store's cart).